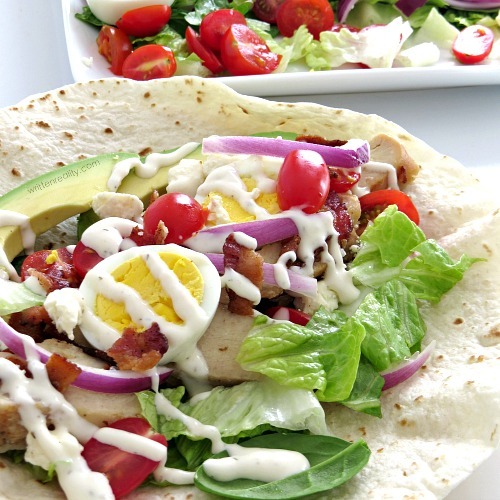 Cobb Salad Wrap Recipe : Here’s the best cobb salad recipe that’s wrapped in a warmed flour tortilla for an easy meal idea you’ll love. 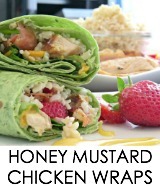 When the springtime hits, I start looking for recipes for new wraps and sandwiches. 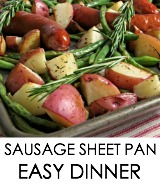 I like easy recipes, of course, and I like to find ideas that are filled with fruits and vegetables that are in season and easily available in our area. Lately, however, I’ve seemed to have a craving for even more fresh vegetables. I’m getting older and so I need as many vitamins and nutrients I can get! And what better way to get all those nutrients than from a daily intake of of fresh vegetables all wrapped together in a warmed tortilla wrap? That’s why I thought I’d share my best Cobb Salad recipe that I like to serve as more of a grab-and-go sandwich wrap. 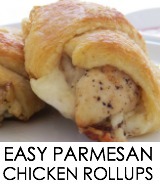 Although I usually use leftover turkey for these, I decided to make this one with a deli-style Rotisserie chicken. As with all of my favorite recipes where I use a deli-style Rotisserie chicken, it really added an extra kick of flavor and I think I’ll keep using the chicken instead, since it’s such an easy way to prepare a quick meal, too. Layer the center of the warmed tortilla with a sprinkling of the ingredients and top with a drizzling of the Ranch dressing. Fold the ends of the tortilla, wrap, and enjoy! Layer the center of the warmed tortilla with a sprinkling of the ingredients and top with a drizzling of the Ranch dressing. Fold the ends of the tortilla, wrap, and enjoy!